Hair stands with its root embedded in a small pouch-like structure known as a follicle. Bacteria, yeast, or fungi may attempt to attack and destroy hair follicles resulting in hair loss and reduced hair growth. Excessive sweating, usage of makeup, shaving or wearing clothes with rough inner texture or tight fit may also damage the hair follicles. Diabetes, HIV, wounds or cuts, or inappropriately treated water may be causative agents as well. Itching, bleeding, inflammation boils, and/or puss are clinical indications for folliculitis. The appearance of these on the stomach or arms and stomach upset is also observed in various cases. One must consult a dermatologist if there is swelling, redness, or severe pain. A dermatologist is the best person to help diagnose folliculitis. In some individuals, it disappears in about two weeks time. If not, hot compressions of salt water, antibiotics, medicated shampoos, and other hair care products may be recommended for treatment. In case of recurrence of folliculitis or associated symptoms (especially inflammation), laser hair removal can prove to be of great help. 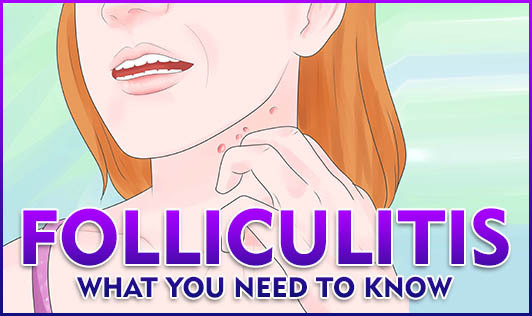 Treating wounds, using lukewarm water for bathing, bathing after exercise, and wearing soft-textured and loose fitting clothes can help prevent folliculitis as well prove to be effective during the treatment period.